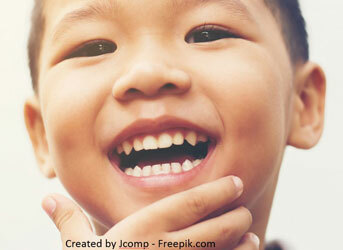 It is possible for children less than 3-years-old – even babies – to develop tooth decay. This can happen when babies are allowed to fall asleep with a bottle. This exposes their newly grown teeth to long periods of sugar from milk, formula or fruit juices. The sugar from these fluids feed the bacteria that live in all mouths.The bacteria then produce acids that can destroy the teeth. 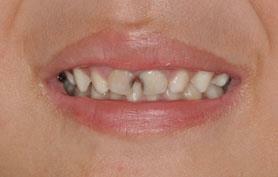 In this child, tooth decay has destroyed much of the upper two front teeth. 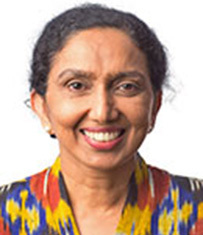 Even breast feeding on demand and letting the child fall asleep while suckling can cause rampant tooth decay called nursing caries. Don’t allow a child to fall asleep with a bottle containing milk, formula, fruit juices or other sweet liquids. Comfort a child who wants a bottle between regular feedings, or during naps, with a bottle filled with plain water. If a pacifier is used, always make sure it is clean and do not dip it in anything sweet. Introduce children to a cup as they approach 1 year of age. Children should stop drinking from a bottle soon after their first birthday. Keep baby’s teeth clean by wiping the new teeth with a small terry towel. This will remove any milk residue. 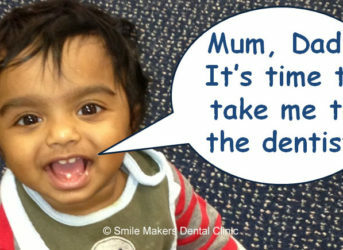 Bring your children for regular check-ups as early decay can easily be overlooked. Don’t think that tooth decay can’t happen to young children. 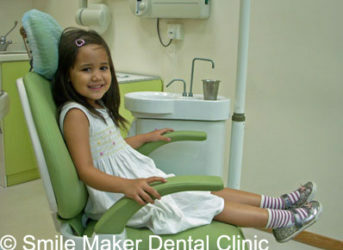 Bringing your child to the dentist early will give you an opportunity to learn good hygiene techniques and allow any early decay to be treated. Remember that allowing decay to develop in your child will cause him pain that is completely unnecessary.